The NWS Storm Prediction Center has updated its tornado outlook for later today and tonight and the revision is in the wrong direction. 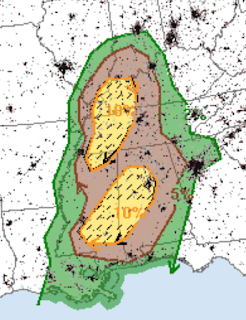 The brown represents a significant tornado threat. The yellow is an enhanced threat of a tornado occurring. And, the hatching represents the threat of a strong tornado. People who live in these areas should keep up on the weather as the day progresses and, especially, if thunderstorms approach. Note: We no longer do live-blogging of storms.